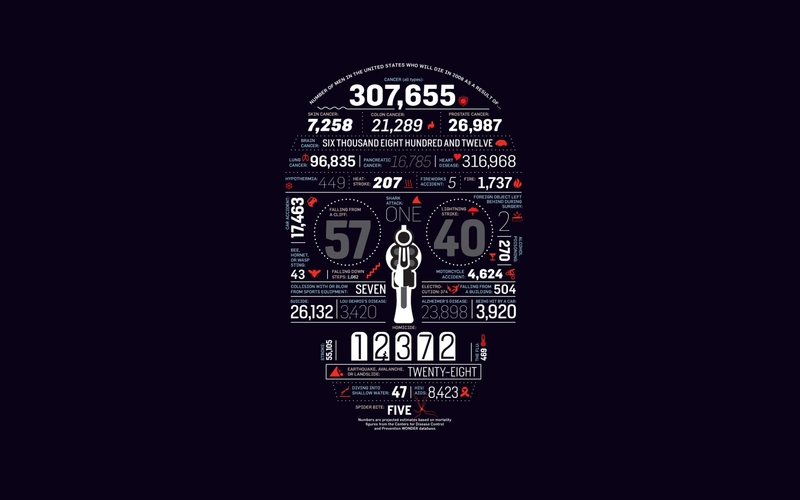 This "infographic" uses simple visual techniques to emphasize a potted selection of statistics from a security survey. You may be interested in the information presented but I'm fascinated by the manner in which it is presented, the graphic visualization. The author of the graphic has used artistic license in selecting particular image types, sizes, colors and fonts to depict and highlight what he/she feels are the most important elements. The resulting colorful graphic image is visually appealing, if somewhat facile and potentially even misleading in places e.g. in representing 'Large organization hacking vectors by percentages of breaches within hacking' as a series of 4 differently colored circles, are the circles purely representational/figurative or are the sizes determined by the proportions - and if so, is it their areas or diameters or some other parameter that's important? I am conscious that the eye is easily deceived by exactly this sort of comparison. Speaking as a trained scientist, I'm personally not a big fan of the glitzy approach, although I can appreciate that some viewers will absolutely love it - they may not have the mathematical/scientific background, interest and/or time to glean information from the regular graphs, charts, tabular reports and wordy analysis that we scientific types tend to prefer. I can see that if it were backed by the data, the graphic might entice viewers to take more of an interest in the numbers. It would be fantastic if they could click on relevant parts to drill-down and explore the underlying numbers and analysis in more depth, but unfortunately all we have here is a golly-gosh image summarizing a more traditional report. Sure the graphic has immediate impact but that soon wears off, leaving viewers with a key message or two perhaps but I suspect having little lasting impression. Although there's a chapter in our book about using metrics i.e. data analysis and presentation, it's a rather brief introduction to an enormously important aspect of metrics. We chose not to go into great depth on this subject as it is covered very well by the existing literature - pick up literally any statistics book for starters. I think there is a valid lesson here about making our metrics presentations more engaging, interesting and memorable, while at the same time being careful not to take things too far. Did you even spot my earlier comment about the author highlighting whatever aspects he/she feels are important? Anyone summarizing and interpreting factual information that will be used in decision making has an implicit responsibility to the reader to remain true to the data. Being selective about what we present, and how we present it, is itself a form of bias. PS Contrast this visually striking infographic with the more conventional tabular representation of similar statistics. Which version will you remember next week, next month, next year?